White grubs may be the most damaging turf insect pests in the United States. According to the U.S. Department of Agriculture, Japanese beetle grubs alone cause an estimated $234 million in damage each year — $78 million for control costs and an additional $156 million for replacement of damaged turf. Japanese beetle and masked chafer adults are attracted to turf with moist soil which means they are especially attracted to lawns that get watered during hot dry spells. During the feeding period, female beetles intermittently leave plants, burrow about 3" into the ground— usually into turf— and lay a few eggs. This cycle is repeated until the female lays 40 to 60 eggs. Moist soils are certainly easier to dig through than hard, dry soils. Eggs will dry up and die under very dry soil conditions. The eggs also die when soil temperatures are around 90°F. Higher soil temperatures are typically associated with drier soils, as well as high air temperatures. 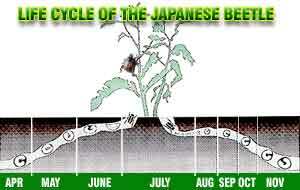 White grubs are the larval stage of many different beetles, including the Japanese beetle. 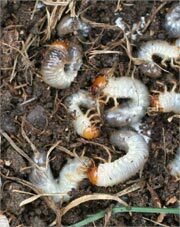 The grubs live below ground and feed on the roots of tender grass plants that soon kills the plant. They are most destructive mid-late summer, but the damage they cause may not show up until early fall and by then, it's too late. The best time to control grubs is in early summer, just after they hatch. At this time they are very susceptible to treatment and just before they start causing extensive damage to your lawn. The bacterial milky diseases, Bacillus popilliae Dutky, has been quite effective at controlling the grubs in certain areas of the eastern United States. The spore count must build up for 2 — 3 years to be effective and during this time you should not use an insecticide against the grubs that are needed to complete the bacterium cycle. In Ohio and Kentucky, test trials have not produced satisfactory results. Additional experiments are needed to determine the lack of efficacy of milky disease in these soils. Parasitic nematodes have recently become commercially available. Products containing strains of Steinernema carpocapsae (Biosafe, Biovector, Exhibit, Scanmask) have been marginally effective against white grubs. Preparations containing Heterorhabditis spp. seem to be more effective. Apply the nematodes when the white grubs are small. Irrigate before and after applying the nematodes. White grubs are best controlled when they are small and actively feeding near the soil surface, usually late July to mid-August. However, with the development of new grub control chemistry (e.g., imidacloprid [Merit] and halofenozide [MACH2]), applications in June and July have sufficient residual activity to kill the new grub populations as they come to the soil surface in late July through August. Control of white grubs in late-fall or early-spring is difficult, at best, because the grubs are large and may not be feeding. Only trichlorfon (Dylox) and carbaryl (Sevin) formulations are available for such rescue treatments. The key to good control is to make an even application and water thoroughly. Lawns having numerous white grubs soon will show signs of injury. If browned areas haven't recovered once cool evenings return with adequate moisture check for white grubs 1" — 2" below the surface. Damaged grass areas will typically just peel back when pulled or raked. When the grass is pulled back you'll probably notice one or two white grubs, but with a little scratching, you'll soon uncover quite a few. The threshold for lawn damage is 5 — 6 grubs per sq. ft. which means that if you have more than 5 grubs in a square foot area, you'll see extensive lawn damage. Once the damage becomes visible, it's too late to control. Damaged white grub areas will not recover as the plant and root system is dead. Before making repairs the grubs will have to be removed either chemically or by hand. Manually removing the grubs is not hard once the dead grass is removed. If you have white grub damage and want to make repairs to those areas in the fall, you'll want to make sure that the grubs are under control before making repairs. Just overseeding these damaged areas without removing the grubs will not be successful as the white grubs will soon eat the new grass seedlings roots. Products labeled for use earlier in the season (MERIT) won't control white grubs in the fall. Products containing trichlorfon (Dylox) and carbaryl (Sevin) are faster acting insecticides and will kill grubs in 3 - 5 days. Bayer makes 24 Hour Grub Control which contains Dylox. Be sure to read label directions on white grub control products before purchasing. Treated areas should be watered to at least 1" deep before application of the chemicals and then after application another 1/2" of water should be applied. have already reached their full size, but it's not too late to make repairs. Once the white grubs have been treated or removed you can then proceed with making repairs. If you have large damaged areas, slice-seeding may make sense. If areas are smaller, use a lawn rake or hand claw tool to scratch the surface of the dead grass. Loosen the soil with the claw. If necessary add a little additional soil / peat moss, reseed and keep evenly moist. Next year in late June or early July apply an application of MERIT following label directions or contact a local lawn care provider and order a Grub Prevention Treatment.